The professional juicer made from 100 % stainless steel. 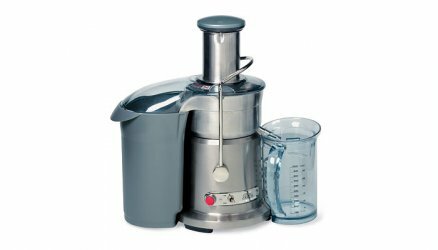 The powerful motor in conjunction with the high-quality cutting surface and stainless steel micro-sieves make the Juice Fountain an absolutely first-class product. Juicer with 2 speed settings. Leading physicians recommend five fruit and vegetable dishes a day. Easier said than done! Why not increase your intake of valuable vitamins, fiber, folate, iron, potassium, magnesium, etc. with fine juices? With the 7.5 cm wide slot whole apples fit in the Juice Fountain. The fruit is crushed and the centrifuge efficiently extracts the juice. The powerful motors, combined with high-quality cutting surfaces and stainless steel micro-sieves, make the Juice Fountain an absolutely top device. Whether soft or hard ingredients, you will quickly turn them to the finest juices. In the morning, a vitamin-rich blackberry, pear and grapefruit mix? After work, a mixture of mango, kiwi and pineapple? A subtle tomato, cucumber and carrot cocktail appetiser? Whatever your heart desires - the Juice Fountain allows you to enjoy virtually all fruit and vegetable varieties in liquid form, thanks to the extra-large filling slot and the two speed settings.